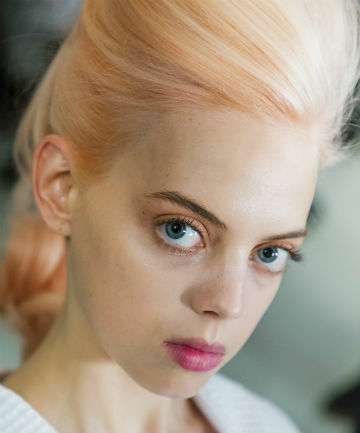 Did you catch the mid-century glam pastel explosion at the Marc Jacobs show at New York Fashion Week? "I think we've colored about 37 girls," said Redken Global Color creative director Josh Wood in a press release. "This is the biggest color project I've worked on, with every single girl being a different color." It's likely not pastel hair as you've come to think of it, though: "Marc didn't want a 'fun' pastel, he wanted an aged, vintage pastel where they look like they have a history to them," explained Wood (he even described the look as "anti-unicorn" in a feature with Harper's Bazaar). Achieving this "grown-up pastel" look took a lot of layering and mixing of metallics, pastels and brights from Redken's various color collections over a freshly bleached base. "Although some of the colors look like one color, if you go up close, they look meshed with many colors layered, which keeps the color from looking heavy and makes it more complex," Wood said. And in addition to all that color, there were also a few different styles and shapes at play: Redken Global Creative Director Guido Palau created a mix of dramatic buzzcuts, along with exaggerated chignons and voluminous updos (inspired by 60s icons like Barbra Streisand). The gravity-defying looks were created using a lot of the popular Redken Guts 10, $19.50, as well as pads and extensions. "This is an example of taking the idea of dressing hair up to the extreme," said Palau in a statement. "It's not about the technicality of the hair — it's about keeping this hair a fantasy. The end result is beautiful in individual ways." Keep reading to see the full spectrum of "anti-unicorn" color at the Marc Jacobs Spring 2019 runway.